On Friday 20 October our first Year 12 graduates celebrated their Valedictory. The event was both humbling and exhilarating. 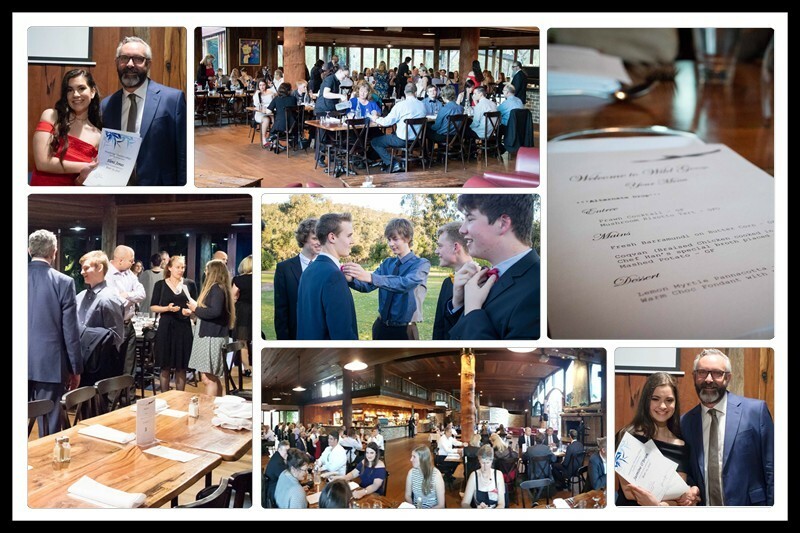 Throughout the night, there was a strong sense of how well our first Year 12 students had been taught, and that they had been given opportunities to shine. The wonderful element was to see how far these students had come, their personal appreciation for MCC and the gratitude of their parents. Firstly, I would just like to thank my parents, my family, teachers and fellow students for granting me this opportunity to stand here today and give this speech and for encouraging me to achieve my best during my time in school. 2087 days ago... does anyone know the significance of that day? It was when we first began Middle School. I just want you to think about the first day of Year 7. It was a wild time, wasn’t it? I had a monobrow, Bella’s dress was down to her ankles and there was a lingering cloud of 'Hello Kitty' and 'Lynx' deodorant which was so thick Amber would have an asthma attack at the sight of an armpit. It was a time where, whether you attended Mundaring Christian College or not, we as a group, a generation had discovered the power of 'Wikipedia' and 'copy and paste' and how seemingly simple the task of making a teacher cry was, so much so that Mr McNeill was forced to take over our Year 8 English class. For me, and I’m sure many of my teachers at the time would agree, my participation in Middle School was more disruptive than beneficial. I mean, your girl likes to talk! And I’m sure some of you can agree, we had sold ourselves short too many times during Middle School. It was hard to acknowledge opportunities and encouragement when we never believed we could achieve success. It wasn’t until Year 10, that I had finally understood, and believed, like I believe Tupac is alive and Mr Pethick with a beard looks like Zayn Malik, that to get respect, you have to give it. Mundaring Christian College is a community where failure - because you think you can’t do something, because you think you’re not good enough, because you believe you’re not good enough, is not an option. Teachers encouraged me to strive for more than I had convinced myself I was capable of and granted me opportunities never thought imaginable in Year 7. It took a lot of us a while to recognise that the teachers weren’t against us, they were with us, trying to help us. That is perhaps why I’m here today, giving this speech, because I have been continuously supported by teachers, fellow students and family to achieve my best. Although we may move ahead in our lives, stepping on stones and not settling for second best, the teachers and the community here at MCC will always remain a cherished part of our memories. Mr Hurworth will always have 10 puns up his sleeve, Mrs Sorgiovanni will always remain a fashion icon, Mr Hewson, although not here tonight, will never fail to announce every milestone in his son’s life, Mr Barker will always wear his Eagles tie and cufflinks with pride when the Eagles win and Mrs Green will always say “howdydoody” as a greeting. And for the other teachers that I didn’t mention, you will always remain a part of everyone’s memories, hopefully for good reasons. The queen and leader, Beyoncé once said, “I dream it. I work hard. I grind till I own it… I slay.” And this is true. Our time at Mundaring Christian College is coming to an end, but we have dreamed and we have worked enough to enter the lives of who we’re truly meant to be. Leaving MCC, school, Year 12, and our years of compulsory education behind, this is our opportunity, our opportunity to do exactly what we find interesting. Whether you had a good experience, or a not so good one, we have all been granted the opportunities required to realise we are more than what we thought we were. This room is filled with future mechanics, historians, chefs and even possibly an occupational therapist. But more importantly, this room is filled with people who accepted the opportunities and encouragement granted to them by teachers. Many of us reached our full potential in these past two years, and not only has it been encouraging, it’s been enriching and elevating. As I look out to the class of 2017, there is not one person in this room that I haven’t seen grow and develop into unique and admirable people. We share 99.9% of our DNA with 7.6 billion other people. However, it is that 0.1% that makes us different, it makes us who we are and who we will become. Some of us are more unique than others… Some like to wear rainbow socks and ripped pants or crawl through the cavities of the roof. Some others, are a bit more daring, opting to order a delivery of kebabs, much to the delivery man’s worst fears of delivering to a school. And there are even some who can solve a rubix cube, that doesn’t even look like a rubix cube, in any amount of time shorter than I ever could. These distinctive differences within each and every one of us make us individuals. As such a small class, we have developed a tight-knit companionship with each other. We are bonded through laughter, kindness and bit of banter here or there. Our diversity is our strength and the opportunities to achieve success are within our grasp. We are one great, graduating class. There is no doubt, that our class, has been the most successful and outstanding Year 12 group in the history of MCC, probably because we’re the first ones, but we really did set the bar high. Although some still have exams to do, and some don’t, today will formally mark the beginning of the rest of our lives, but so did yesterday and so does tomorrow and every day after that. Our destiny is not pre-determined by the grades we received in school or other’s expectations of us, but it’s the experiences we have endured through the past 14 years. The lessons we’ve learnt, the values of selflessness, encouragement and graciousness and the memories we’ve made will always remain with us throughout the duration of living. The decisions we make as adults can change the course of our lives within an instant. We may dream of success, a definition of which is different for each of us as individuals, but we will not always succeed. This can be disheartening, but it is important to remember in these situations that success only becomes a failure, when you allow it to defeat you. As we lift our heads high and point our gaze to the future, hungry for success and eager for experiences, we will become great, we are great and we will continue to achieve greatness. Though our paths may differ, we are equal. We are equal in the sense that we are only just beginning our lives. We are equal because our lives consist of limitless opportunities. We are equal because each and every day we have another chance to achieve greatness. Whether you had a good experience, or a not-so good experience, one thing is sure that this group of people in this room right now have the abilities to shape the future for following generations, leading the path to greatness. I have seen many people come and go from this school, but one thing I am sure of is, I would not have chosen a better group of friends to graduate with, not even if Beyoncé was here, I mean maybe if Beyoncé was here. So, to the class of 2017, may we head into our adult lives with success in our minds, opportunities at our grasp and laughter in our hearts. So, we can do the exact same thing we’re already doing, 'Netflix', without feeling guilty about it. Congratulations, we made it!